STONY BROOK, N.Y., April 9, 2013 – The Stony Brook University Art Gallery was newly dedicated as the Paul W. Zuccaire Gallery on April 4, 2013, to coincide with the anniversary of the late Paul Zuccaire’s birthday, and in appreciation of the past support as well as recent commitments of daughter Alice Jean Zuccaire and the Paul W. Zuccaire Foundation, the latter of which will be matched by the Simons Foundation Challenge Grant. The ceremony was held inside the newly named Paul W. Zuccaire Gallery located at the Staller Center for the Arts and attended by University President, Samuel L. Stanley Jr., MD, Staller Center for the Arts Director, Alan Inkles, University Provost, Dennis N. Assanis, PhD, and friends and family of Paul W. Zuccaire, including daughters Alice and Rhoda. 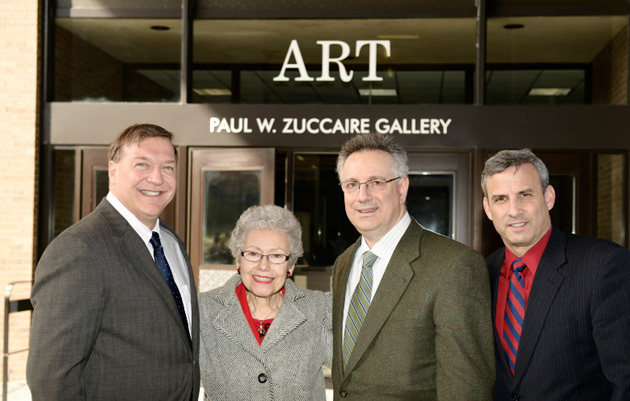 The Paul W. Zuccaire Foundation was founded in 1999 by Estelle Zuccaire in loving memory of her husband. Its mission is to perpetuate the memory and spirit of Paul W. Zuccaire through the encouragement, promotion and support of the arts, education, health, humanitarian and other related activities. A French immigrant who arrived at Ellis Island with nothing, Paul Zuccaire created his own success by founding two insurance companies and other insurance businesses, and came to be recognized as a pioneer in the field. Over the course of the last 28 years, the Gallery has exhibited the works of notable artists as Yoko Ono, Larry Rivers, Roy Nicholson, Elizabeth Murray and Philip Pearlstein. It is home to the Stony Brook Senior Show, which features the work of the undergraduate arts majors, and it is also the venue for the annual MFA show, where talented candidates for masters in fine arts are able to display their artwork in a beautiful, professional setting. The Gallery’s exhibitions have received grant support from the Paul W. Zuccaire Foundation since 2004, and Alice Zuccaire has been involved since 2002 both as a personal supporter and through the Paul W. Zuccaire Foundation. “I am filled with pride and overwhelming gratitude by your honoring my father with your presence here today,” said Alice. The Stony Brook University Staller Center for the Arts offers a wide variety of world class performances from September to May, with the acclaimed Stony Brook Film Festival taking place in July.